A few weeks ago I found myself magically transported to a log cabin in the countryside surrounded by super lovely crafty ladies. Whilst on said trip I finished one pair of socks and got halfway through another, before declaring I was bored of socks (for now). Luckily with all the aforementioned lovely ladies on hand, before I knew it a skien of yarn was thrown at me (courtesy of Kate) a crochet shawl book appeared beside me (thanks to Joanne and Kat) and the required crochet hook was provided (on loan from Gilly). 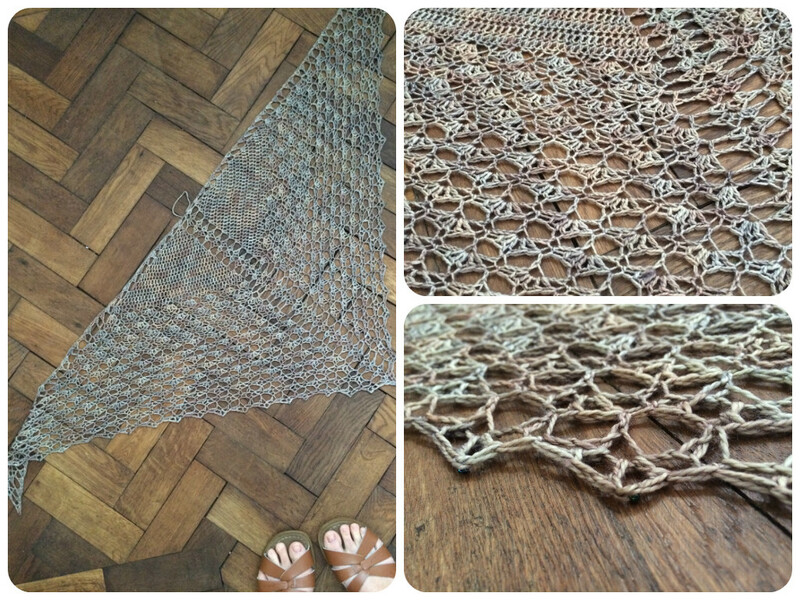 By Sunday evening I had myself a gorgeous new shawl which will forever remind me of a really really wonderful weekend. The shawl is Transposition from The Shawl Project: Book One, yarn is Sock by Sundara Yarns. I followed the pattern to the letter, apart from adding some beads to the edging. 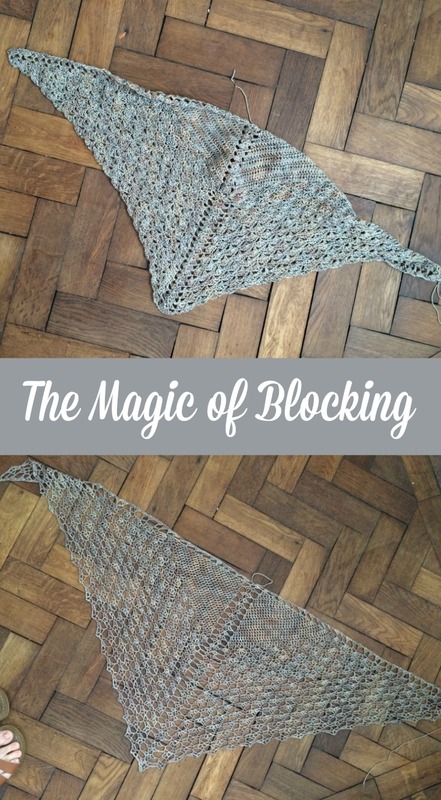 What I really wanted to show you was the magic of a good block! 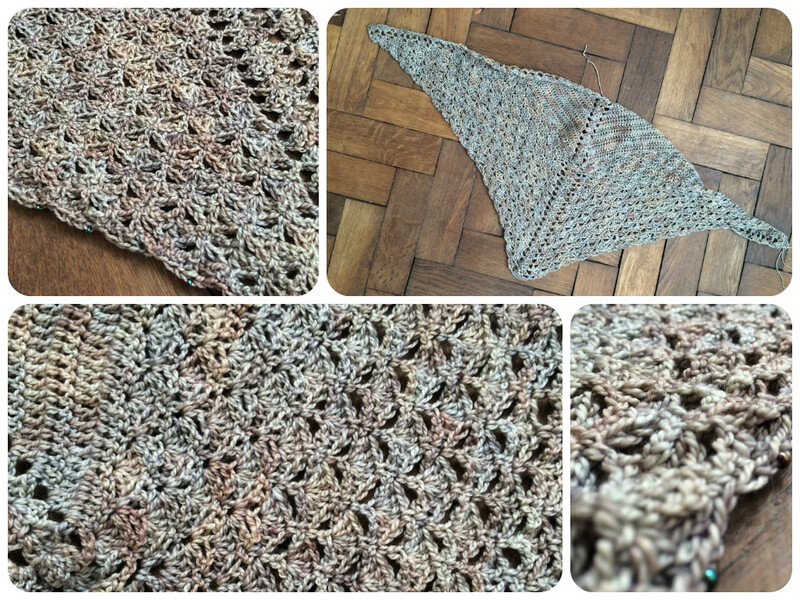 Here is the shawl as soon it was finished, looking very scrunched and a bit blurgh to be honest. After a good soak in some warm water and a little eculan (wrapture is my favourite), I pinned it out on a towel on my lawn (I have yet to unpack my blocking boards). It was such a beautifully sunny day it dried in no time at all. And here it is in all it's glory. I'm always so amazed by the magical powers of blocking. Also do you see my beautiful floor there?! I finally go round to waxing the hallway floor and I love it oh so very much. We just got back from the most fabulous weekend away celebrating lots of birthdays. On Friday lunchtime (which in it self was Johnny's birthday) we boarded the train at Cheltenham and headed down to Somerset to celebrate Johnny's Grandmother's 90th birthday. It was the most fantastical weekend, with lots of beautiful sunshine, delicious cakes, music and loads and loads of family! I feel so lucky to have found myself joined to this wonderful collection of people and so pleased that my children get to belong here. I can't imagine any better way to spend your ninetieth birthday, than surrounded by your descendants, a family band to serenade you and plenty of delicious cake! There were lots of late nights for the children who got to spend hours playing croquet, practicing (Harry Potteresque) duelling and doing handstands with their cousins, but coped incredibly well. Effie downright refused to nap on both the train journeys (there and back) until 5 minutes before we reached our destination. On our return home yesterday she barely stirred after that, all through getting off the train, getting in our cab, back to the house, a change of nappy and pyjama application and was therefore fast asleep in her bed come 6pm and had to be woken up for nursery this morning! Bruton, where we spent the weekend, is one of my very favourite places. We stayed in a really really great bed and breakfast (Oak House), which was just off the High Street. We had a family suite which included a kitchen and living room and two bedrooms. Which meant decorating the cake Milo and I made for Johnny on Friday morning, was much easier than we had anticipated it being. 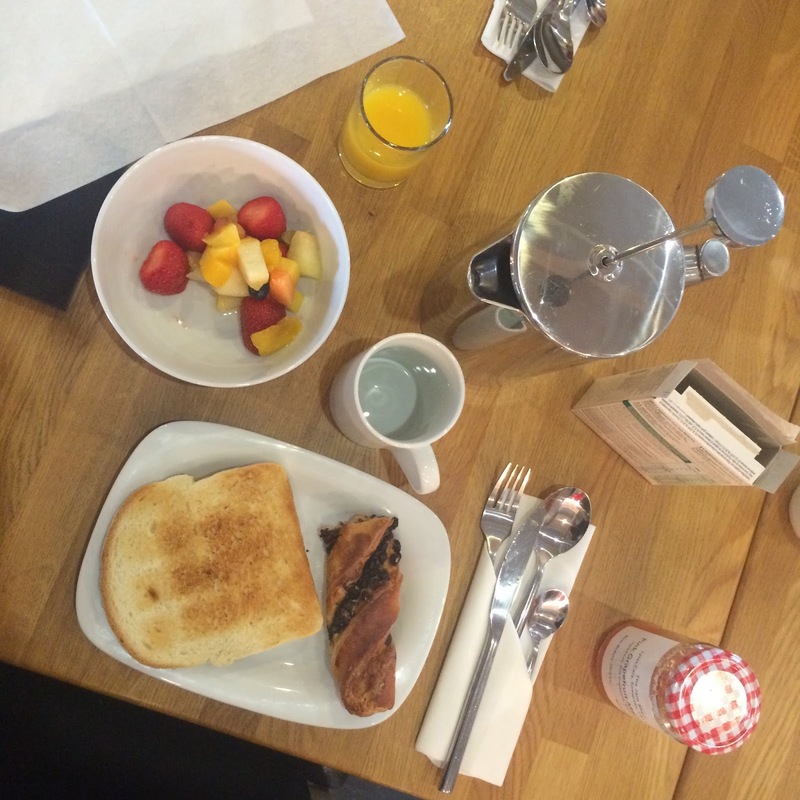 Breakfast was exceptional too, there was a buffet which included just about anything you could imagine wanting (no full english, but to be honest it certainly wasn't missed with everything else that was on offer!). We really had the best weekend, it was the perfect start to the summer holidays. We're so looking forward to the rest of our summer adventures, after a couple of days of rest first! 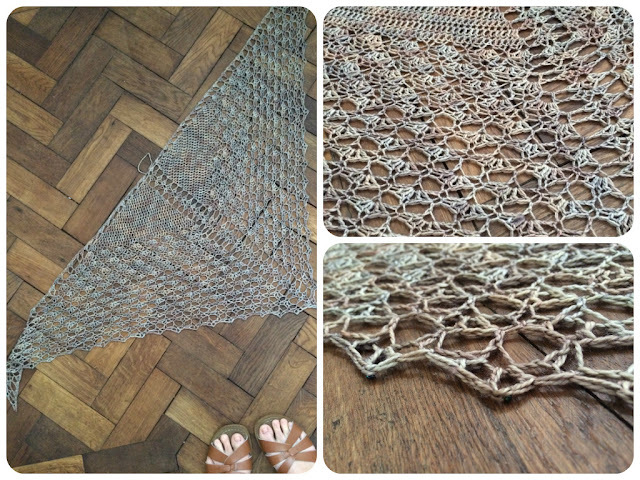 I have put the pattern for the Pom Pom Shawl (originally published in Inside Crochet) up for sale over on Ravelry. I love this pattern so so much, it's so snuggly and cosy, quick and easy to make, but the pom pom edge creates a fabulous splash of detail. It's also super handy as you can slip the end of the shawl through one of the little triangles to hold it in place around your neck. The sample was crocheted in the ridiculously delicious Acadia by The Fibre Company. But any double knit yarn would work well. 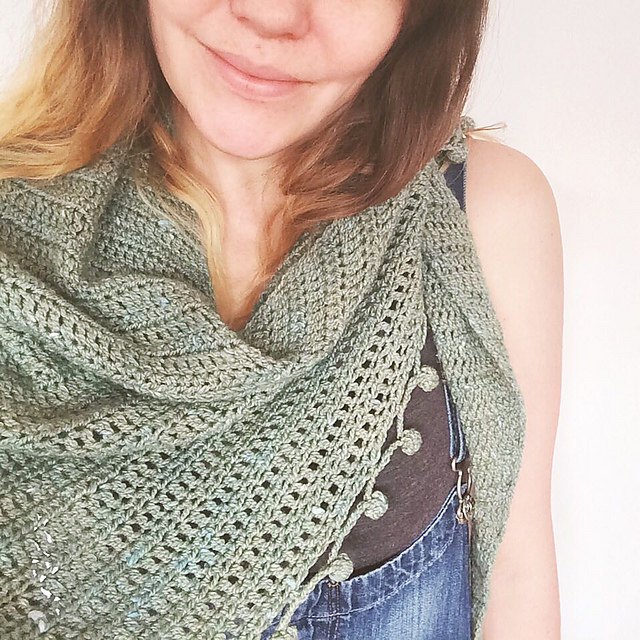 There's an automatic 50% discount on the pattern until Monday, just add it to your cart and the discount will be automatically added, in case you need a project for the weekend. I'm so very much loving watching everyone's socks grow as the Crochet-A-Long progresses. 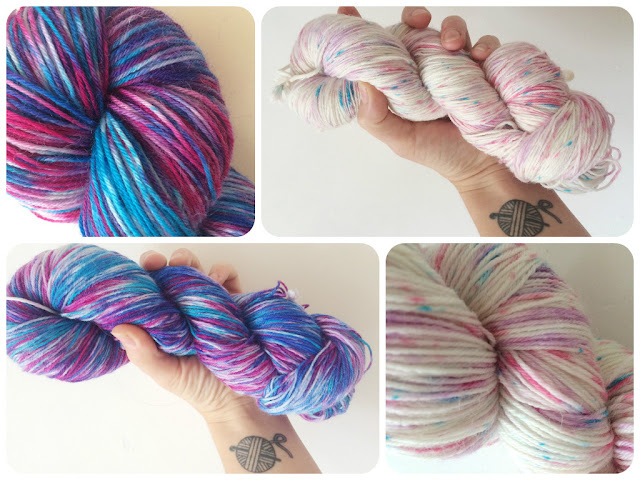 It's so inspiring seeing everyone's different yarn choices. I finished my first pair this weekend and immediately started another! These are the Winter Wonder Socks in Aesthete from Burrow and Soar. I love them so so very much. The second pair are the Fallen Leaves Socks in a yarn I dyed myself, it's a self striping in Gryffindor inspired colourway (though I didn't really have the right colours to get in right). I'm really enjoying the way the stripes are looking with this stitch. As I've recently been dyeing much more yarn than I can use I thought I'd offer up a couple of skiens as prizes for the CAL. They are both sock yarns on the same base (100% superwash merino, 100g/400m). 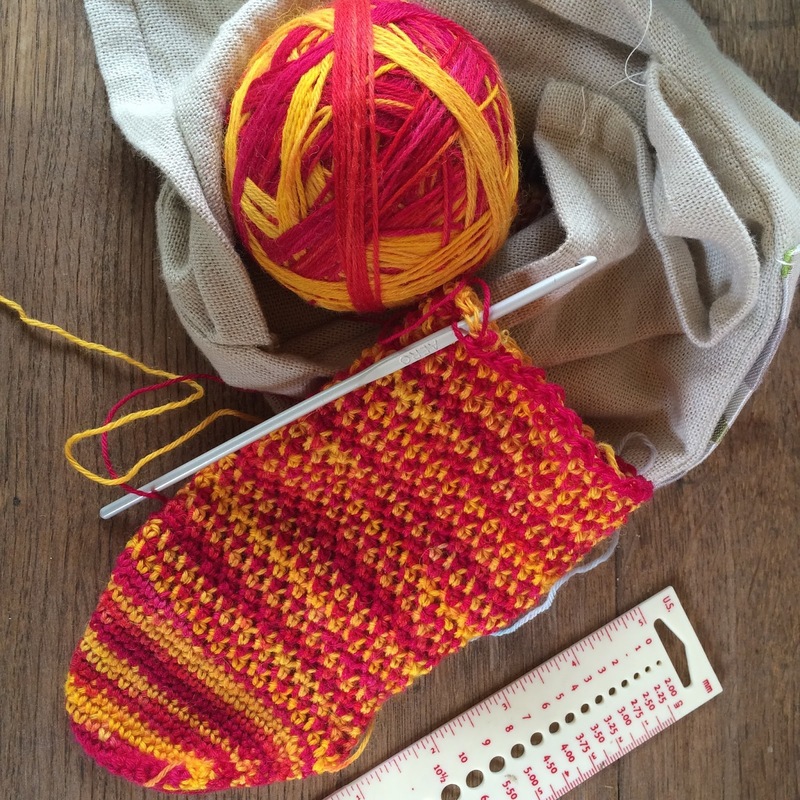 Anyone who posts a photo of the progress on any of the socks from The Crochet Sock Collection, on Instagram (#thecrochetsockcal) or over in the facebook group before 31st July will have their name put in the hat to win a skien, it's a simple as that. The Crochet Sock Collection is available to purchase as a PDF download here and as a print copy here. This weekend, I headed off into the countryside where I found myself staying in a cabin on a farm surrounded by the most wonderful ladies. The weekend was a celebration of the birthday of Joanne (Not So Granny), we walked, we ate, we drunk gin and we crocheted lots. It was the perfect medicine for the events of the previous weeks. I came away feeling so calm and relaxed and inspired. We stayed in the Damson Cabin at The Hatch booked through Canopy and Stars and I cannot recommend it highly enough. It was such a beautiful location with everything we needed for a weekend, we didn't leave the farm once. A weekend away from everything in the company of such beautiful, inspiring ladies was magical indeed. Visit VickiBrown's profile on Pinterest.